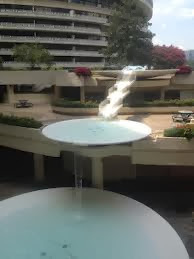 These were pictures of some water sculptures that I took at the Watergate complex in Washington, D.C. The waterfalls remind me more of the landscaping around Floridian high-rises or the water flumes at Walt Disney parks than of what you normally see around town, here. I liked these aesthetically and think we generally need more integration of nature and art into our urban (and often sterile) environment. A little more green, a little more clean, and a lot little less crime and congestion--and don't forget a decent climate--those were some of the things that I look for in attractive places to live and to work. Then again, as my father always taught me, you can live anywhere--if you have your health, family, and a good job. He's right, a place is just a place--and it's the people and love between them that makes it great. 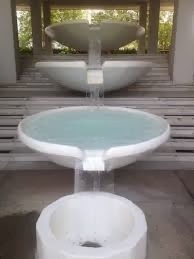 So water sculptures aside, give me a real home, and that's the best place in the world that I want to be.